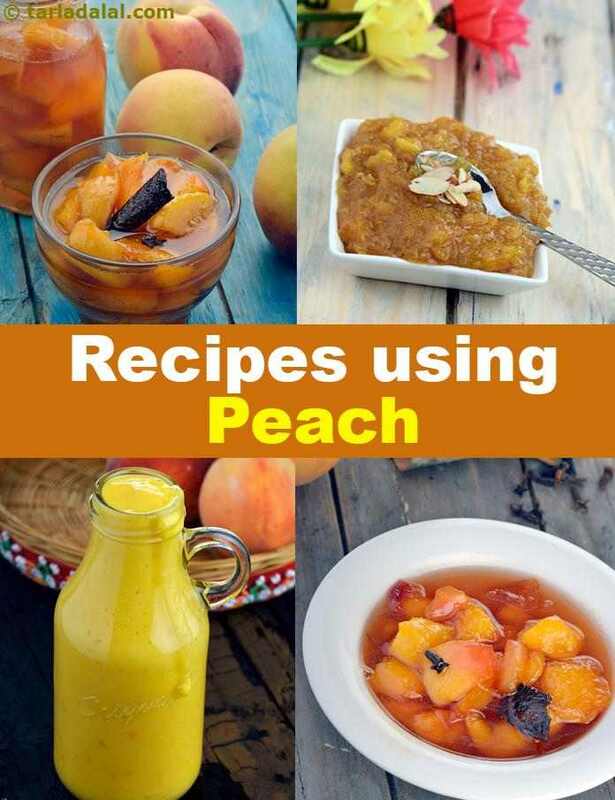 A luscious recipe of french origin, with the goodness and flavour of fresh peaches. A combination of two of my favourite fruits, peach and orange. Chilled stuffed peaches served with warm sweet and tangy orange sauce is just enough to please all your senses. When a light dessert is called for, a granita cannot be surpassed. The exotic taste of peach works very well with mint. Flavourful fresh peaches blended together with mint strike just the right balance for your taste buds. The peach pineapple smoothie draws its sweetness from honey rather than sugar, giving it a rich taste. Wheat germ along with curds helps achieve the perfect thickness for this smoothie. However, when wheat germ is not available, simply add some extra peaches. Vitamin C boost poured in to a glass should be one's choice to fight infections and common cold. Peach romanoff is quick warm dessert made by flambeing peaches with brandy and orange juice and then served with creamy vanilla ice-cream and fresh cream. This is a dessert that you cancharm adults with, at a dinner party.